Growing up, I heard more Johnny Cash and Gaither Trio songs than Hank Williams songs, but Hank was a part of my music listening experience from an early age, and I often consider Hank’s life, amazing story, and tragic ending. Perhaps this is why I ended up a country musician even though I it is not my favorite type of music. I will say that it is definitely my favorite type of music to play live. Neither Hank WIlliams nor The Oakwood Annex Cemetery were running through my mind at all as we drove Interstate 85 into Montgomery, Alabama on a sunny Sunday afternoon. Also absent were any thoughts of Civil Rights, the Civil War, Rosa Parks, Martin Luther King, Jr., segregation, the Confederacy, or any other aspects and events that are part of the eye-opening history of Montgomery. I knew about these events, and even where they took place, but there was a disconnect in my mind between the history and the actual place. Fortunately, what was running through my mind was Alan Jackson’s song “Midnight in Montgomery”. I was singing the song, and I remembered what it was about. Alan Jackson, in his bus, the Silver Eagle, visiting Hank’s gravesite in Montgomery. I’m not commonly prone to the middle school reaction of OMG!, but that is the moment, on I85, that my mind made the connect. 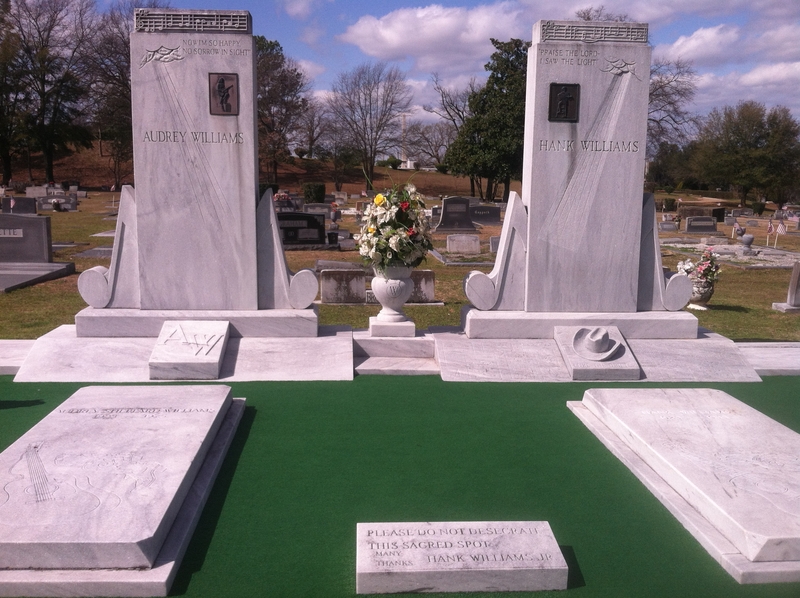 OMG – Hank Williams is buried here! We decided to go visit the site the next day, hopefully get some good pictures, and then figure out what else we could learn about Montgomery as a whole. I learned how little I knew about what happened with Rosa Parks, and even watched a re-enactment in the Rosa Parks Museum. Now when I hear about the incident, I feel like I was there – understanding the event itself much better, as well as the events leading up to, and where history turned immediately after the incident. All of this was only a tiny portion of the things we did and saw walking the streets of this historic city. I learned so much, all because of one little spark of history that came to me as a song running through my head. So for these random thoughts that come to me that change my life forever in surprising ways, I have to thank my parents for playing the music, Alan Jackson for writing about the MAN, and last but never least, Hank Williams, for writing the songs that made me want to visit you when I was close. Posted on March 1, 2013 October 25, 2016 by Matthew A BennettPosted in Essays, MusicTagged black, cemetery, country, country musician, Essays, grave, grave stone, guitar, hank williams, history, images, musician, sunny sunday afternoon, the south.